My Dahon Boardwalk has served me well over these few years, from routine commuting purposes, to overseas touring trips, and is generally a very good all purpose bike. It had to fulfill a variety of purposes, as I could only have one bike due to limited space and cost. That explained the various upgrades and add-ons to the bike to allow multi-purpose usage. With the addition of a few other more specialised bikes to my collection, such as the fast Merida Scultura 5000 road bike, the wet weather Avanti Inc 3 commuting bike, and the compact folding Dahon MuEX, the Dahon Boardwalk no longer needs to be a do-it-all bike. With the road bike being faster, the commuting bike being more weather resistant, and the Dahon MuEX having a more compact fold, the Dahon Boardwalk seems to be losing its relevance with respect to my usage. With that in mind, my intention is to build a new bike that is different from the other bikes mentioned above. With the success story of upgrading the 2x10 speed flat handlebar Wheelsport Fantasy mini velo bike, I have come to realise that the Wheelsport Fantasy frame is actually a pretty good mini velo frameset. That gave me the idea to use this mini velo frame as the basis for a new bike project. The overall plan is to transfer all the components from the Dahon Boardwalk to the new Wheelsport Fantasy mini velo frameset. This would create a new bike that is different from my other bikes. A fast and lightweight mini velo equipped with a Ultegra Di2 11 speed road groupset and fast rolling 20" wheels would differentiate it from my other bikes. 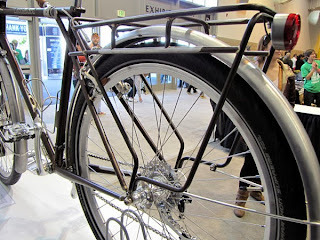 As a mini velo frame, this frame is not foldable. However, this is not a problem for me as I find that I hardly ever fold my Dahon Boardwalk nowadays. 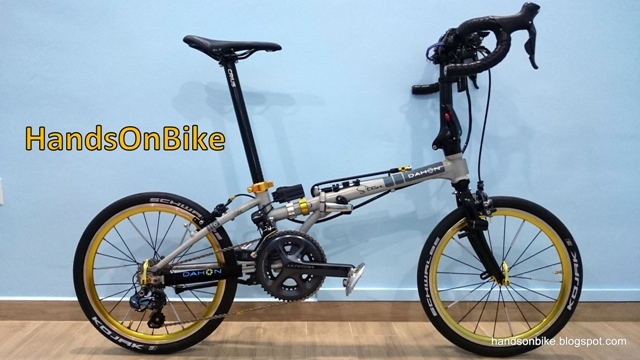 If I need a folding bike, I prefer to use the Dahon MuEX instead as it is more compact and lightweight. Let's take a look at the new Wheelsport Fantasy 2.0 frameset! Designed for caliper brakes only, as can be seen from the brake mounting on the seatstays. Welds on the aluminium frame have been sanded and polished, giving a very well finished look to the joining areas. Nice and smooth welds look similar to those found on high end Tern and Tyrell frames. Glossy black Wheelsport decal on the matte black frame for a very subtle look. Similar to that found on the Avanti Inc 3 frame. Cable stoppers for shifter outer casings. Cable adjust bolts are included, but I removed them as they are not needed, since I am using Di2 shifting. English threaded BB shell that is 68mm wide, which is the standard spec for road bikes. Underside of the BB area on the frame. The cable guide has been removed as it is not required. Overall weight of the frame alone (inclusive of headset cups, RD hanger and seatpost clamp) is about 1760 grams. Compared to the Tyrell FX frameset weight (2.2kg for frame only), this Wheelsport Fantasy frame is lighter by about 400 grams, which is great. One difference is that the Tyrell frame has folding capabilities while this Wheelsport frame does not. Next, let's look at the front fork of the Wheelsport Fantasy frameset. There are two types of forks available. The first is the aluminium type with a steel steerer tube, which is meant for use with a folding handlepost. Then, there is the more lightweight version, which is a carbon fork with a long aluminium steerer tube. This carbon fork is designed to be used with a long carbon spacer, and thus does not have a folding handlepost. For maximum weight savings, the carbon fork is the one to use. Carbon fibre weaving on the fork can be seen through the clear coat. The fork weighs 605 grams, not really lightweight. This is due to the long steerer tube required. However, it is still lighter than the Tyrell FX folding fork which is 900 grams. Carbon spacer that will be used together with the carbon fork. Usage will be shown in the subsequent posts. Weight of headset bearings and top cap is 70 grams. With this, the total frameset weight is slightly over 2.5kg. Not really lightweight, as average road bike carbon framesets are usually 1.6kg or below. Still, the weight of this Wheelsport Fantasy frameset with carbon fork is lighter than the Tyrell FX frameset weight of 3.1kg. Also, it is cheaper than the Tyrell FX frameset. Now that the new frameset is ready, it is time to move the components from the Dahon Boardwalk over to this new frame! However, due to me using some non-recommended components and setup, I will first need to check the compatibility of the wheelset and brakes.